The number of babies born exposed to opiates in the United States increased fivefold between 2000 and 2012, according to the latest available data from the National Institutes of Health. Within hours or days after birth, these infants may experience opioid withdrawal, leading to significant weight loss and seizures. But few studies have effectively considered the effects of in utero opioid exposure—either from illegal drugs or from those prescribed as part of addiction treatment—on children’s physical, mental and social development. This leaves clinicians facing a difficult challenge: How best to meet the health and recovery needs of a pregnant women, while ensuring the health of their babies? The problem is that many of the animal studies done to date may not translate well enough to human biology and physiology, according to a recent analysis by Byrnes and Fair Vassoler, a research assistant professor at Cummings School. That’s why they’re designing experiments that more closely mimic real-world conditions, while isolating biological effects from the knotty socioeconomic issues complicating addiction. Their recent findings suggest even small exposures to the opioids can have far-ranging impacts on the next generation. And these rigorous animal models could lead the way to new treatments for the most vulnerable patient populations. 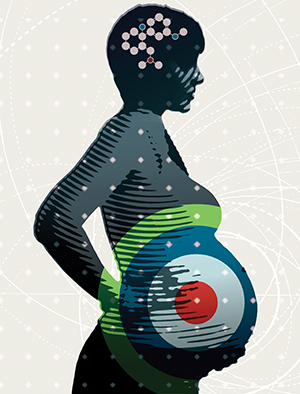 There’s more that doesn’t translate: Many studies claim to represent full-pregnancy and perinatal exposure to opioids, when rat and human gestation periods just aren’t comparable. And the vast majority of the animal opioid models used morphine, instead of the more commonly misused substance oxycodone or therapy drugs such as methadone. “Ideally, we need these models to test different replacement therapies so we can determine their effects in offspring,” Vassoler said. For example, she suspects that methadone may be problematic because it seems to create strong withdrawal symptoms in babies. Cummings School researchers are working on a rodent model of voluntary opioid intake that more closely simulates real-world maternal drug use. In the first rodent study to feature intravenous self-administration of an opioid, rats were trained to choose if they wanted a dose of oxycodone. “The rats manage their own drug use by pressing a button when they want an infusion,” Vassoler said, noting that this simulates a person choosing to take drugs. The rats had access to the oxycodone for at least three weeks before mating—a long period in the life of a rodent—as well as during pregnancy, followed by a withdrawal period after birth. “This allows us to see how the physiological changes that occur during pregnancy affect their desire to take more or less drugs, absent all those societal restraints that tell human mothers what to do,” Vassoler said. The researchers then examined the animals’ offspring-maternal interactions to assess if drug exposure affects communication and care, and if the pups develop symptoms of withdrawal. Overall, the study, presented at the November 2017 annual meeting of the Society for Neuroscience, found that even limited voluntary intake of oxycodone before and during pregnancy can disrupt maternal care, as well as cause changes in proteins critical for brain development in offspring. A higher cumulative intake of oxycodone by the mother was also correlated with lower body weights in her offspring, as well as fewer calls from the pups requesting attention from their mother. Cummings School Research Assistant Professor Fair Vassoler is working with Weinberg Medical Physics, a Maryland-based medical-device incubator, to study a new way to potentially curb opioid cravings. In March, the project received a $230,000 seed grant from the National Institute of Health’s National Institute on Drug Abuse. The work will test if a new kind of deep-brain-stimulation can reduce drug-seeking behaviors. Traditional deep-brain stimulation uses electrodes implanted in the brain to trigger different kinds of neurological activity. The FDA-approved procedure has successfully treated movement disorders, such as Parkinson’s disease, with few serious side effects. While a graduate student researcher at University of Pennsylvania, Vassoler conducted research indicating that the treatment reduced cocaine-seeking behavior in rats, a model of human relapse.